One of My Favorite Picnic Recipes From Taste of Home! One of the best thing about this recipe is it can get your creative juices following. I always come up with different sandwich fillings everytime I make it. Cut loaves in half horizontally; hollow out tops and bottoms, leaving 1/2-in. shells (discard removed bread or save for another use). Combine oil and garlic; brush inside bread shells. Sprinkle with 1 teaspoon Italian seasoning. 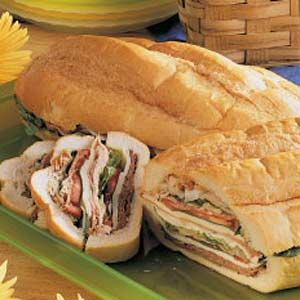 Layer bottom of each loaf with a fourth of the roast beef, mozzarella, basil, tomatoes, salami, artichokes, salad greens, chicken and onion. Repeat layers. Season with salt, pepper and remaining Italian seasoning. Drizzle with remaining oil mixture if desired. Replace bread tops; wrap tightly in plastic wrap. Refrigerate for at least 1 hour before slicing. Yield: 2 loaves (12 servings each). Nutrition Facts: 1 serving (1 slice) equals 341 calories, 18 g fat (7 g saturated fat), 47 mg cholesterol, 991 mg sodium, 26 g carbohydrate, 2 g fiber, 19 g protein. I love the Taste of Home website for great healthy recipes! There are also delicious high calories ones also! Chance to Win a Market Basket for Picnic Ideas on Our FB Page! We are giving away a market basket/picnic tote on our Facebook page! Post a favorite picnic location or food (would love a recipe link if possible) that you and your family has enjoyed between now and May 27th to help us all get ready for Memorial Day weekend outings! You could win this cool picnic tote if your name is drawn. You can post multiple recipes or location suggestions to be entered more than one time! If you are not familiar with Facebook...here is an ehow.com website with a quick how to register video, I found by doing a Google search for "how to register on facebook." There are also many others.